Although tastes may vary, by and large people generally enjoy watching TV shows or reading comic books, superhero or otherwise. Now sometimes you may find a caliber of person who doesn't enjoy either of these two activities, and in that case, all we have to do is say, 'No worries mate. Have a nice day', before getting the hell away from them. As for the rest of us, on the other hand, why don't we sit back, relax, and check out these two books about TV shows and comic books. 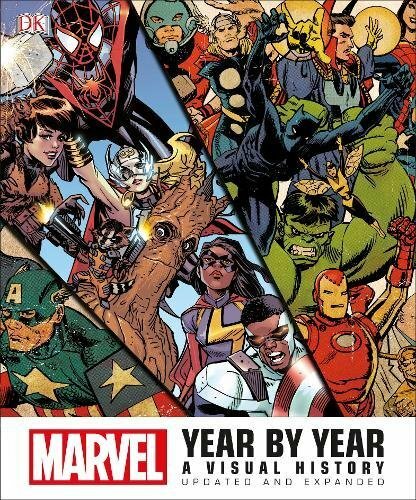 Synopsis: 'Marvel Year by Year: A Visual History', is one of the most comprehensive accounts that details the back-story and origins of this esteemed publishing house. 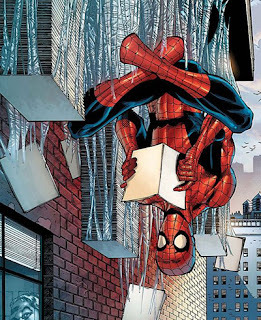 This includes illustrative profiles on such superheroes as Iron Man, Spider-Man, Hulk, Thor, and even the Guardians of the Galaxy, and this is complemented by comprehensive accounts on each characters origins and landmarks within the fields of publishing, movie, and TV. On top of that, you'll also get a slew of information pertaining to real-life events that influenced the writers and creators at the time. Documenting everything from the company’s beginnings as Timely Comics, circa 1930, right up to the present day, and you can safely say that this updated edition contains exciting new coverage on everybody's favorite family of heroes. This new edition also has a spectacular, specially commissioned cover designed by Dan Panosian which features a selection of fan-favorite heroes and villains. The art in this book is really amazing, as it showcases legendary artwork created by some legendary artists. It's a great book for people who want to know more about Marvel Comics. Historically everything is pretty damn accurate, and this is coming from an obsessive egghead steeped within the comic book field. Genre fan's might like to know that this book isn't solely focused on superheroes, as it also delves into other such genre's as War, Western, Crime, Cartoon, True Romance, and Sci-Fi. Each yearly chapter is nicely complemented by a small section that denotes what took place during that year, such as a movie being released, or a world event. One of the most surprising aspects is that you can stylistically see the change of time over the years, especially where trending topics are concerned. Due to its size and girth the book is pretty heavy, so I wouldn't recommend you carry it around with you. It's not a great buy if you're a fan of DC Comics. It may be a bit on the expensive side for those of you with shallow pockets. The book is fairly big so it might be difficult to house in a conventional bookcase. The chronology of each character is a bit basic for most comic book specialists, fractured even. Synopsis: Do you like watching television? I mean, do you really-really like it? If so, then why don't you pick up this book created by Samantha Chagollan and Erika Milvy? Essentially it's an interactive and comprehensive list of 101 family friendly TV shows, which range from popular picks of today to classic shows of decades past. Each page focuses on a single TV series with basic information pertaining to each show, including the actors involved, the years of syndication, and the shows overall tele-visual rating. There's also a section at the bottom of each page that allows young television buffs to write in their own opinions and observations about the show. 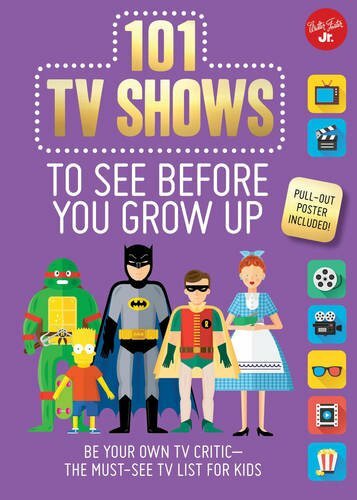 So from toddler to tween, to every age in between, and all in all '101 TV Shows to See Before You Grow Up' is a fun handbook for TV lovers of all ages. Each section was cleanly laid out and the graphics used weren't distracting to the eye. Something else I loved about the layout was how it designated parts of each page to certain consistent categories. For instance, in a panel that ran down the left-hand side of each and every page, is a section denoting a shows genre, age range, etc-etc. If you love reading TV related trivia, then you're going to go nuts over this book. Each page showcased at least one slice of trivia related to each show. The complementary poster is amazing, and worthy enough to stick on any wall. There are so many great TV shows in this book, you can't help but loose track of time when going through it. This book is a nice general book and solely focused onto the world of American TV and pop-culture. You need to buy your own pen to fill in the appropriate sections. Obviously this book doesn't cover every TV show that was ever made, and to some (specially those who didn't read it's title properly), this may be a bit of a disappointment. Most of the shows seen in this book are American TV shows, and not from any other country. You will not find any actual 'real life' photos in this book, which I myself found slightly perculiar, even though the complementary graphics do manage to illustrate each show and what they represent. The book is not in alphabetical order, but rather, organised by genre. So if you want to find a show by its name, well, good luck with that, as I'm sure you will find it eventually.